The maquette, or model, of the proposed bronze monument.Photo courtesty of Ludo Leideritz. Local artist Randy Morgan, the creator of the bronze mural on the downtown Hobie store, “The Waterman’s Wall,” conceived the idea of a monument to Carrillo after running into him at local eatery one day. “I’ve always thought he deserved a monument. Skipper is such an inspirational figure in this town. He’s always at the pancake breakfast, the sporting events, the Patriots Day parade and he was such an inspiration at the high school and the little league park for decades,” Morgan said in an email. The sculptor has made a two-foot tall prototype of the proposed monument he is calling, “Have a home run day.” A plaque is to be included with the sculpture that will be dedicated to Carrillo and “all individuals faced with unique challenges to overcome,” Morgan said. A book signing of “Have A Home Run Day,” by Carrillo’s sister, Alicia Rowe, and a kickoff party for the project at Forest and Ocean Gallery netted $2,500 last month, enough to buy the materials to begin making the frame for the statute, said gallery owner Ludo Leideritz. Morgan enlisted the help of Leideritz, who represents him at Forest and Ocean Gallery. 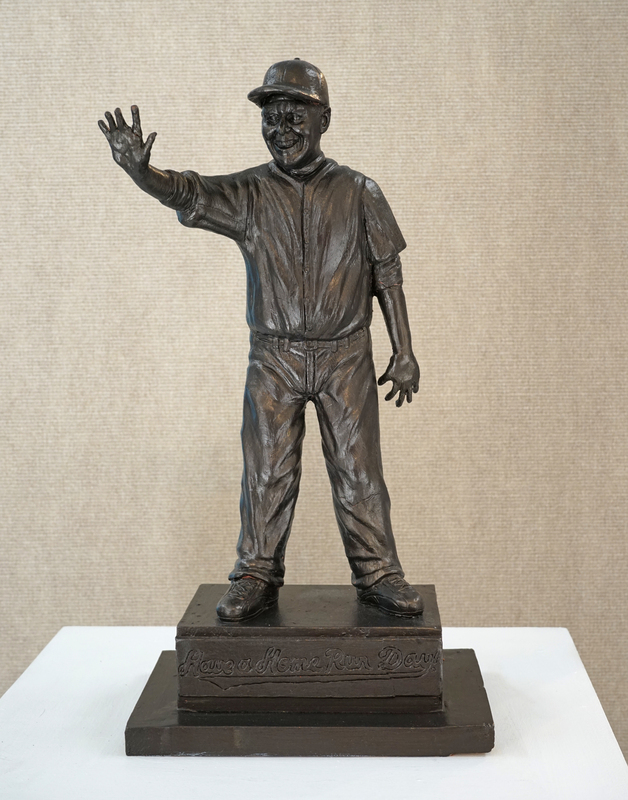 The entire process will take six months and involves making a clay mold that is used to make a casting, which will result in the final bronze figure, Leideritz said. Rowe’s book describes the life of Carrillo, known for wearing a different baseball uniform daily, loyally attending youth athletic events, and peppering his speech with baseball trivia and terminology. Carrillo, now 79, is the namesake of the Laguna Beach Hgh School field. 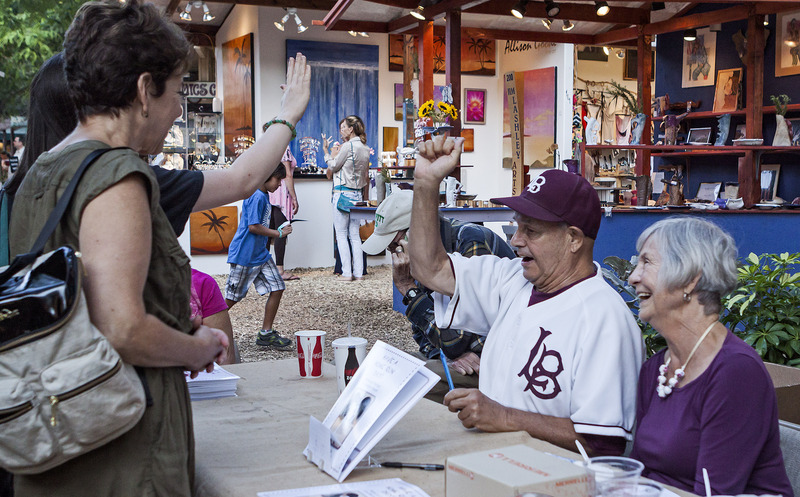 Skipper Carrillo at a book signing with his sister. Another supporter of the campaign inscribed the back cover of Rowe’s book. “Skipper Carrillo is the extraordinary man known as Mr. Home Run Day. Born prematurely, Skipper grew up with a disability that gave him a unique ability to express love with a pure heart and spirit,” wrote local chiropractor, Dr. Gary Arthur. The book is available at Tuvalu and Laguna Beach Books. In all $85,000 will be needed to complete the project. Morgan and Leideritz are working on selecting a location for the monument. A GoFundMe page has been started to raise the funds to finish the project. “Although we have two private properties offered near Coast Highway, the desired spot is the high school,” Leideritz said. Former lifeguard Jerry Chilvers has requested a public hearing to consider a sculpture location on district grounds, district spokeswoman Leisa Winston said. “We are in the process of offering him that opportunity at an upcoming meeting,” she said. When asked how all this attention feels, Carrillo said he felt “very honored.” When he wished me a “home run day,” it was my turn to feel honored.